The alternatives of how to dispose of a dead body are pretty limited-- bury it, cremate it, or (for the very rich) freeze it. Now there is a new alternative that costs around $7,500. The bad news is that it is pretty expensive. The good news is that it could appreciate in value. The Algordanza Company of Chur, Switzerland can make the remains of departed loved ones into artificial diamonds. Using technology that was first developed by GE in the 50s, this company can turn Aunt Mable's body into a gem fit to wear as jewelry or display under glass. Once Algordanza (which means remembrance) receives a body, it begins a process that takes between 3 weeks and 3 months. 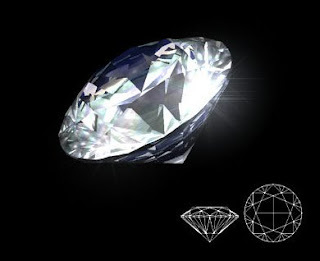 A diamond is made entirely of carbon. Since a human's ashes contain about 2% carbon, the rest of the ash is filtered out, leaving a diamond of about one caret. Most of Algordanza's business comes from Japan. However, a few funeral homes offer this service in the US. Incidentally, there is one company in England that will turn the remains of your dead pet into diamonds. Honey, I got you a diamond for our engagement! It's my first wife. Your comment to this story is HILAROUS.